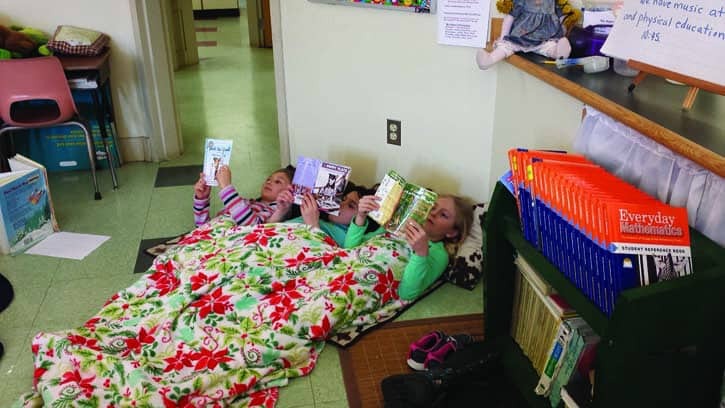 Mettawee Community School 3rd graders settled in for an afternoon of reading during the school’s annual celebration of Read Across America Day on March 2. WEST PAWLET — Instead of the Mettawee Community School’s weekly All School Meeting, each class had the opportunity to get comfortable with their self-selected reading as a way to celebrate “Read Across America Day” in honor of Dr. Seuss’ March birthday. Kim Donaldson, reading specialist, and Kelly Ahlfeld, librarian, organized the school’s annual celebration of reading on Wednesday, March 2. This year’s book for All School Read was “Where’s the BaBOOn?” written by Michaël Escoffier. Students enjoyed milk and a packet of low sugar, nut-free Annie’s bunny cookies as they read.